2014 Primary Election: Central Kentucky Gets Out the Vote! 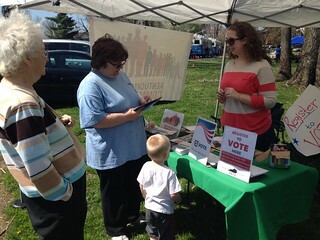 The primary election is on Tuesday, May 20th and the Central Kentucky Chapter of Kentuckians For The Commonwealth is getting out the vote. And, you can get involved! KFTC has done an amazing job with candidate surveys for the 2014 Primary and the Central Kentucky chapter worked hard to develop questions for local candidates based upon local issues we all care about, such as affordable housing, homelessness, diversity, and the environment, among others. We sent surveys out to the candidates so that we can communicate their answers out far and wide and they're now online at KentuckyElection.org There are also links to candidate sites, voting location information, and more. So please share this link with people you know. Our community lost a strong leader the 7th of this month with the passing of April Browning. Her strong voice for justice and equality could be heard on many fronts. In about every speech April gave it often started out with, "First and foremost, I'm a mom." She said in one interview, "My son Elijah . . . makes every day worth living and special . . . That's the first and most important thing you need to know about me." She went on to explain, "But after that, it's really important to me to take initiative to make my community a better place - for Elijah and everyone else." April was a board member of Central Kentucky Council for Peace and Justice. She was the inspiration and one of the founders of Occupy Lexington in 2011. Her voice was heard at the rallies organized by Kentuckians Against the War On Women. She was a spokesperson around the restoration of voting rights for former felons in Kentucky and for Kentuckians For The Commonwealth. April was born in Flint, Michigan, but grew up in Central Kentucky. She understood first hand the struggle of low-income parents in Kentucky. She understood first hand being denied rights as a former felon for a mistake long past paid for. She understood the struggle of the 99% against the 1%. In her words, "I am politically active and I feel that my voice as well as thousands of other Kentuckians' voices should be heard. ... I'm fighting for progress across the board and this fight is personal." We mourn the loss of her leadership and activism, but her spirit will remain with us as the struggle continues. KFTC members Tanya and Christian Torp are recognized among 50 Community Heroes in honor of Cesar Chavez Day, March 31. On the birthday of the late civil rights activist and labor leader, the Marguerite Casey Foundation’s Equal Voice for Families campaign is featuring on its website local leaders who are redefining poverty. Rupp Arena is known throughout the state and the nation as the home of the University of Kentucky men’s basketball team. For many, Rupp Arena is a symbol of pride and legacy. It can also be a symbol of something else in Lexington: the number of people who cannot afford housing would fill up Rupp Arena twice. This year, affordable housing was at the top of the Central Kentucky KFTC chapter’s holiday wish list. Central Kentucky KFTC members asked Santa Claus to deliver an important message to Lexington Mayor Jim Gray: It is time to prioritize an affordable housing trust fund for Lexington. On Friday morning, Dec. 20th, Santa delivered a stack of Christmas cards to the mayor’s office urging the mayor to take action on the trust fund in 2014.